Disagreeing with a man who may have saved investors over a trillion dollars is not a position I like to find myself in, but the ability to trade ETFs intraday is overly maligned. As a matter of fact, I view tradability as a feature of ETFs. Successful investing boils down to good investor behavior, something I think Jack would have agreed with. Do ETFs tempt investors to trade more? Vanguard themselves studied this several years ago and concluded… not really. In other words, “traders gonna trade”. If you can’t control yourself, the investment vehicle doesn’t matter. A poorly behaved investor may be just as inclined to trade their mutual fund shares as they would their ETF shares. The only difference is mutual fund shareholders have no control over the price they get. Remember, ETFs trade at market-driven prices throughout the day and an investor can accept or decline the offer. Mutual funds settle at the end of the day at a price unknown until the market closes. 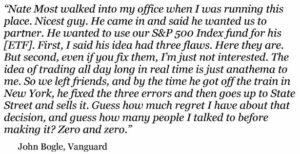 To be blunt, if poor investor behavior equals stupidity, not knowing the price you’re getting is stupidity compounded. At least poorly behaved ETF shareholders know the exact price they are getting when buying and selling. Well-behaved ETF shareholders value knowing the price they are getting. If you can control yourself, why wouldn’t you want to determine the exact time and price you buy or sell investments? When I go to the grocery store, I like to know exactly what I’m paying for my groceries. I don’t like to show up at the checkout line and then be told the price of each item. Furthermore, I value optionality – having the option, but not the obligation, to buy and sell ETF shares during the day. If I buy a ticket to Disneyland, I have the option to go on all the rides whenever I want (lines notwithstanding!). The “mutual fund Disneyland” requires you buy a ticket to line up at the Space Mountain roller-coaster right as the park is closing. Another investor-friendly aspect of ETF intraday trading is who you are transacting with. The structure of ETFs allows shareholders to trade with each other and not with the fund itself. In contrast, mutual fund shareholders interact directly with the fund. The result? Potential tax consequences. Effectively, the ability to trade intraday allows ETFs to operate more tax efficiently. Seems like a benefit to me. Remember, “traders gonna trade”. Better for them to do it in an ETF wrapper where at least it usually doesn’t impact other shareholders. Are there downsides to ETF trading? Sure. You need to know HOW to trade ETF shares properly or risk getting less than ideal execution. –Use limit orders instead of market orders. A limit order allows you to specify the price at which you are willing to buy or sell ETF shares. A market order is executed at the current best available price. A limit order guarantees price, but not trade execution. A market order guarantees trade execution, but not price. A good potential balancing act is to place a “marketable limit order” where you set your limit price at or slightly above (below) the current ask (bid). This increases the likelihood your order is executed, while still offering price protection. –Avoid trading at the market open or close. Markets tend to be more unpredictable at the market open or close, which can cause bigger swings in the underlying holdings of ETFs and result in wider ETF bid-ask spreads. –If possible, buy or sell ETFs when underlying markets are open. For example, if you wish to buy an ETF owning European stocks, it is best to do so when the European stock markets are open. While ETFs are considered “price discovery” vehicles and should reflect investors’ best assessment of fair value even when underlying markets are closed, there is a higher likelihood of better trade execution when underlying markets are open. –Avoid trading during periods of high volatility. Higher volatility is usually a result of greater investor anxiety, which ultimately stems from uncertainty. Trading ETFs in uncertain environments can result in less clarity around pricing. –Lastly, while way down the ETF due diligence checklist, use commission-free ETFs where possible. Because ETFs trade just like Apple or Netflix stock, your broker may charge a $5-10 transaction fee when you buy or sell shares. However, many brokerages are offering increasingly larger commission-free ETF platforms. Somewhat ironically, Vanguard offers investors the ability to trade nearly every ETF without incurring a commission. The bottom line is ETFs offer flexibility, but that comes with responsibility. Just because you have the option to trade ETFs doesn’t mean you always should. The less you trade in a portfolio, the better off you’ll likely be longer-term. Nobel Laureate economist Eugene Fama once said “Your money is like soap. The more you handle it, the less you’ll have.” That is, until some day in the future when your portfolio gets a little dirty. Then you will be glad you have the option, but not the obligation, to clean up.